Super Illusions Thinking Putty: The mystifying color-changing putty. After years of experimentation, Crazy Aaron finally achieved color perfection with Super Illusions Putty. Each tin of putty features dazzling, marbled colors that sparkle, shimmer, and dramatically shift hue depending upon its angle to light. 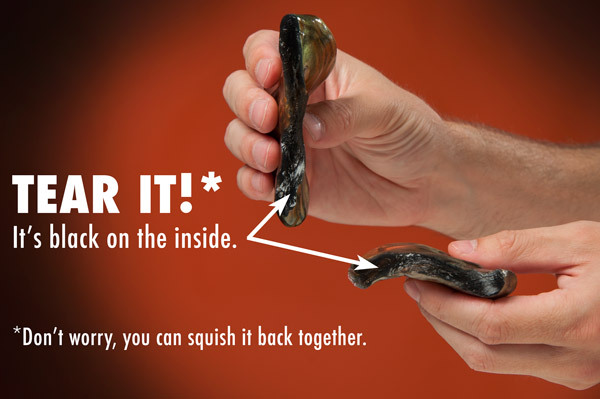 Super Illusions Putty can be bounced, stretched, squeezed, and molded like traditional putty. When ripped, its insides appear jet black. But when stretched thin, it becomes as translucent as cellophane. 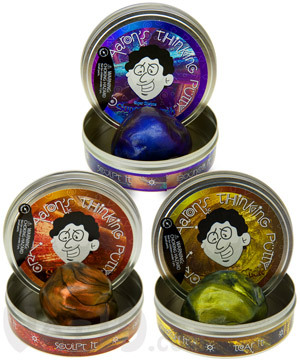 The amazing Super Illusions Putty is available in several color styles. Each tin includes 1/5 of a pound (90 grams) of putty. Made in the USA. Stretch it, tear it, bounce it! 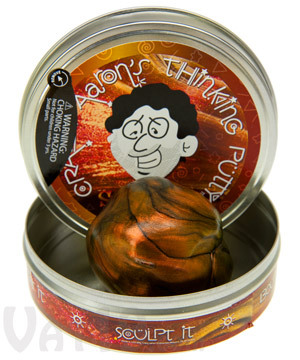 Crazy Aaron, the scientist / self-proclaimed lunatic, spent years developing the Super Illusions Putty. He wanted to create a putty with an exceptional color profile (and a few other nifty features which we'll explain below). Well, C.A., you did it! Super Illusions Putty features brilliant coloring without compromising any of the fun, stress-relieving properties of his other famous putties. Super Illusions Putty features bright and impressive coloring. Putty changes color depending on angle to light! Super Illusions Putty appears almost magical when you shift its position relative to light. Check out the pictures below. 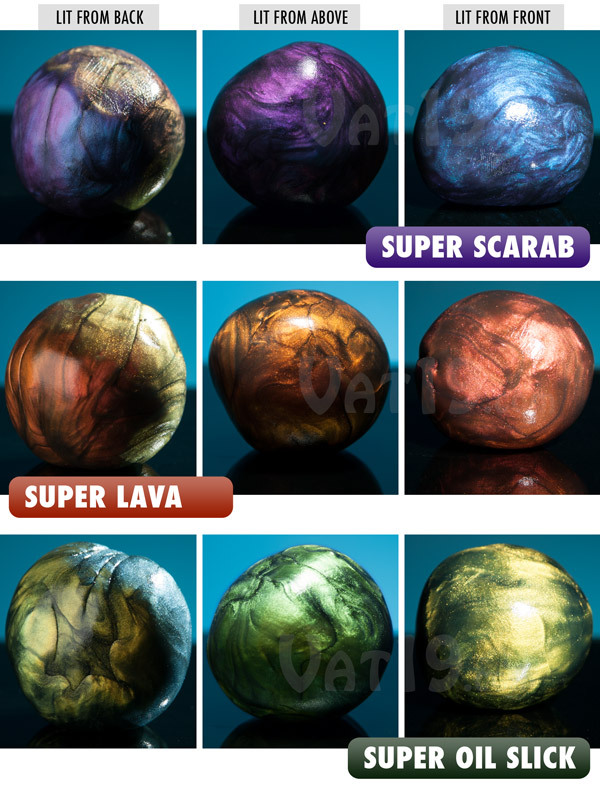 In the first row are three pictures of the exact same putty (Super Scarab), which has been lit in three different ways. Its appearance transforms from yellow to purple to blue simply by repositioning the main light. When backlit, Super Lava features the same yellow highlighting as Super Scarab. It takes on a deep orange when lit from above and shifts to red when lit from the front. The bottom row shows off Super Oil Slick. Notice the drastic change from green to yellow when shifting from overhead to frontal lighting? Awesome! Super Illusions Putty shifts its appearance depending on its angle to light. This putty moves on its own! Super Illusions Putty features a fun memory effect. Here's how it works: stretch the putty and it wants to contract back to its original state. Twist the putty and it wants to untwist itself. The effect is powerful enough to work against gravity. For example, you can stretch it out, hang it upside down, and watch as it shrinks back toward your hand. Keep in mind that the effect is fairly shortlived and will only work for about five seconds at a time. Super Illusions Putty has a tendency to move all on its own (no magnet required)! Putty is all about play, fidgeting, and stress relief. It's fun to squeeze. It's fun to stretch. And it bounces pretty well, too! 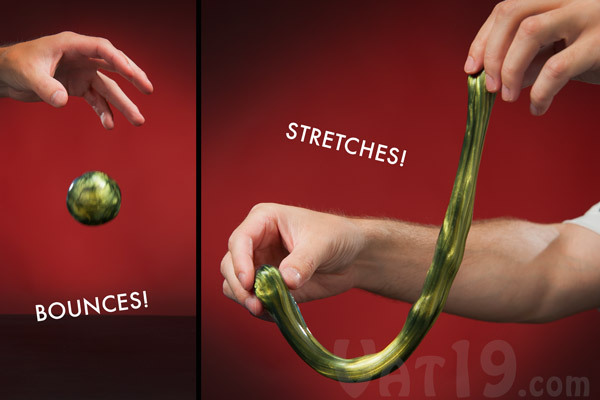 Super Illusions Putty bounces and stretches as well as any "normal" putty. Mystifying colors, but black on the inside? Super Illusions Putty features dazzling bright colors, but when torn appears black on the inside. We're not sure why (and we try not to question a man who calls himself Crazy Aaron), but we certainly think it's awesome! To "rip" your putty, flatten it out and then tear quickly. The site of the rip will be black. Crazy! Super Illusions Putty appears black when ripped. Black on the inside, but translucent when stretched? Tear Super Illusions Putty and it's black on the inside, but when stretched thin, it's see-through. Is that an enormously rotund stuffed animal behind the Super Illusions Putty? Yes. Yes, it is. And it's probably the fluffiest thing we've ever squeezed. 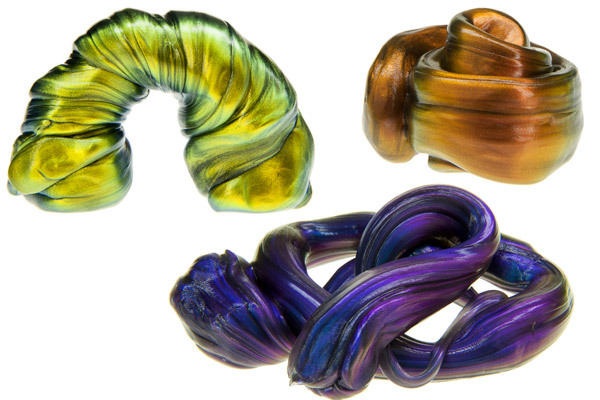 Super Illusions Putty is currently available in three styles: Super Scarab, Super Lava, and Super Oil Slick. Each tin includes 1/5 lb (90 grams) of putty! Super Scarab's colors shift from blue to purple with hints of red and copper. Super Lava looks like liquid hot magma as it shifts from gold to copper through ruby red. It has a metallic shimmer in most lighting conditions. Super Oil Slick appears like liquid metal. It can appear green, yellow, and gold with hints of silver and blue. How does it compare to our other putties? We put several of Crazy Aaron's Thinking Putties through a battery of tests so you can see how they stack up against each other. Enjoy the video below! See how some of our most popular putties compare and contrast one another.